Industry sources are reporting to Edmunds that both Chevy and Ford are planning 4 cylinder power plants in their 2015 generational redesigns, citing gas-related regulations and a growing concerns over fuel efficiency. If their sources hold up, this will be the first time since 1993 that Ford plans to put a four cylinder in its flagship pony car, a change many blue oval die-hards are not so eager to see. If the rumors combine with the fact that Ford has declared it is planning for a global minded redesign, and takes many of the new S550 Mustang’s anticipated changes from its Evos concept, it’s a safe bet that some variation of the new EcoBoost motors will find their way under a Mustang hood, like it or not. Will it be 2014.5 or 2015? While the original, 1964.5 Mustangs came out earlier than other Ford offerings for 1965, they were still considered a 1965 model year automobile. The distinction was made not only due to this early release, but also to differences in motor offerings and other small details that distinguished them from other, later 1965 Mustangs. However, all 1964.5 and 1965 Mustangs were identified as 1965 in their VINs. So what does this all have to do with the new release? If Ford follows the current logic of releasing a new model every 10 years, then expect a 2015 model year debut with the slight possibility of an early order date. I wouldn’t bet on an early release date this time around, though. Ford would be smart not to cannibalize 2014 sales prematurely and it should be safe to bank on a normal, 2015 release for the redesigned Mustang. Back in 2011 Bill Ford Jr., when asked by an audience member at Princeton, confirmed a turbo’d future for the Mustang. Combine this with the heated rumors, reporting by Edmunds and statements by Ford’s Chief Product Official at the 2012 Detriot Auto Show regarding a 4 cylinder, EcoBoosted Mustang and you get dreams of a new SVO; the one thing that might gain the backing of performance enthusiasts. Upon closer inspection, it’s likely Ford puts out a base model 4 cylinder with the turbo 2.0 EcoBoost from the new Focus ST – a motor rated at 48HP less than the current V6 Mustangs. For those still unconvinced of a 4 cylinder option for 2015, read Jalopnik’s well documented following of the new Mustang and reporting by two AllFordMustangs members who claim to have actually viewed a new 2015 test mule and the listing of a V8, EcoBoost and, more curiously, an unsupported 4 cylinder option. They also provided some background on which 2015 spy photos might be accurate and whether they saw an IRS in the new Mustang or not. What does a 4 Cylinder Mean to the Future of the Mustang? For one, it means a more fuel efficient option and hopefully more bang for your buck for purchasers of the base model Stangs. Many would agree replacing the current V6 with a equally or more powerful 4 cylinder motor – or better yet, joining the V6 as an available option – while gaining a substantial MPG boost is a good thing for the car’s future sales. The cause for concern lies in this same mentality being applied to the V8, something that would hit performance enthusiasts and long-time Mustang faithfuls as something similar to a slap across the face. To this, you can rest easy as, unless serious government-related changes or plunging sales numbers come into play, all indications point to the V8 staying an option for the US marketplace. 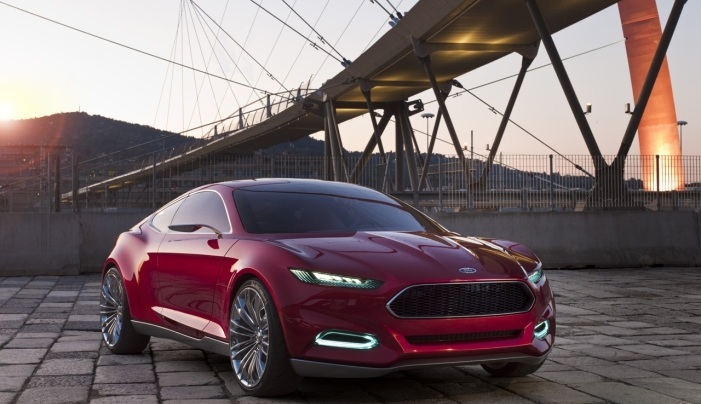 Also keep in mind, all next-generation Mustangs are expected to go on a diet, utilizing lighter parts to trim a least a few hundred pounds off the current models and should be another welcomed change. What’s the verdict: A new 4 cylinder Mustang for 2015: Love it or hate it? Personally, I like the new design concepts. They are in some respects a radical change some people are not willing to wrap their heads around. I’ll bet the new design garnishes a healthy sales bump once they start hitting the lots and reveal solid performance numbers. Sometimes you need to see a redesigned car in person to be convinced of its validity. The new Camaro & Challenger impressed me when they rolled down the road for the first time. They still both have their place. I am hopelessly and madly in love with my 2010 Mustang GT and wouldn’t trade it for the world. I may have to make room in the garage for a 2015 or newer, of course if money falls in my lap in good time! I’d love to see a new SVO. I’ve built a few of the original’s and they have always been very fun cars. I HATE the evo concept though, I really hate that Ford is getting away from the retro lines in favor euro trash roundness. To each his own, I’ll give them this, that evo concept is why I went out and bought my new 2013 GT. I’d be sick if I waited too long and had to get my 5.0 in a shiny rolling egg.